Although subtle, McLaren have introduced a minor change on the car. 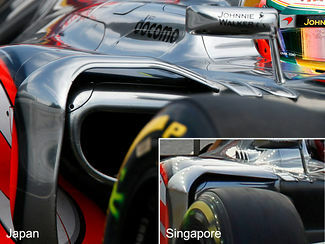 The winglet, just above the radiator air inlet, is effectively a connection between the sidepod panel and the monocoque. The new winglet is a positioned a little higher above the sidepod aims to control airflow just above the sidepod, a crucial area to ensure efficiency of the downwash exhaust. McLaren has always had an exciting car for beauty and functionality. Not a Hamilton fan, but now that he is leaving I can pull for JB. But, I am a Ferrari fan, but their cars are UGLY!! !